Flecky’s recent series of photographs began during a sabbatical while an Artist-in-Residence at the Ucross Foundation in Wyoming. Flecky created photographic images using leaves and branches from the imposing cottonwood trees on the Ucross grounds. These amazing found objects returned with him to his Ucross and Omaha studios, and have influenced his treatment of other natural materials in his photography. 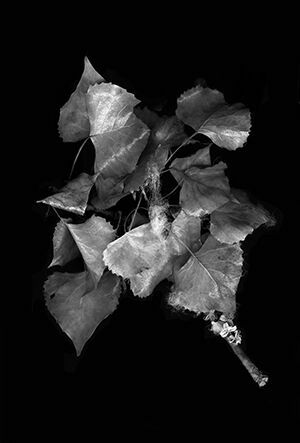 Flecky photographs these natural still life arrangements in traditional and experimental ways, with a large format film camera, scanning the film negatives, and exposing objects directly to photographic paper as “photograms” or cameraless images. The resulting black and white images are highly detailed but surprising unfamiliar in their scale and context; they are simultaneously crisp and haunting.